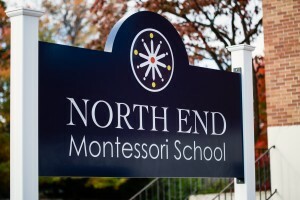 Welcome Parents to North End Montessori School. We are dedicated to nurturing your child’s essential physical, social, emotional and cognitive development in an environment that fosters a true love of learning. Our qualified staff is delighted to work with your family and we look forward to many years of collaboration. In addition to our strong academic curriculum, we will work with you to foster grace, courtesy, leadership, responsibility, compassion, and independence for your child’s successful future. There are many ways to participate in your child’s education here at North End Montessori. Parents may volunteer for field trips, class assignments, holiday celebrations, and share your family’s special stories, traditions and projects with their child’s class. The Parent Info tab on this site contains additional information: refer to Parent/Student Handbook for information about your child’s day to day needs or school practices and procedures; and refer to the downloadable/printable Calendar for important dates such as program start/end dates, open house, special events, holidays and vacations. Please feel free to contact North End Montessori anytime if you have questions or concerns.